Kunekune are a small pig. Their name means fat and round in Maori. They did not originate in New Zealand, as there are no indigenous land animals there. There are many theories on how they got there, the Maoris may have taken them there, as the pig was very important to the Polynesians, and there are still pigs with tassels in the South Pacific Islands. Early whalers and sealers may have taken them, to be released to breed, to be culled for food on their next voyage, or they could well have been taken by the people who settled to farm in the country. All farm stock was imported. Whatever their origins, they have evolved into a charming little pig. In New Zealand Kunes came very close to extinction in the 1970s. They were not used much for meat anymore by the Maoris, and were virtually unknown to the white population. 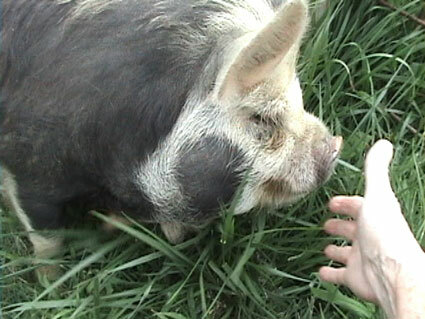 It was then that two wildlife park owners, Michael Willis and John Simster heard about the pig, and set out across New Zealand to buy every Kune they could find for sale, this only amounted to eighteen pigs, and from this original stock, with later additions of more animals, the studbook was formed. 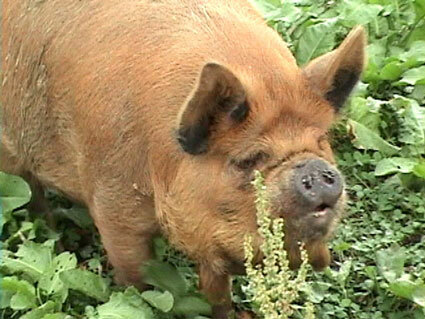 The population in New Zealand is now in a healthy state, and it is proving in great demand as a smallholders pig. Kunekunes arrived in Britain in 1992 Zoe Lindop and Andrew Calveley had worked in New Zealand for several years and were charmed by Kunekune. After meeting Michael Willis, and learning how endangered these little pigs were they decided to import a small group to breed in Britain. As the Kunes only existed in New Zealand it was important to have a population in another country, in case of disease in their home. Michael bred for them a wide range of Kunes, because it was important to have as wide a variation of genetic stock brought into the country as possible. Kunes began arriving in the United States in 2004.